A lot of buzz has been created over the last couple of years on the implication of cloud computing in business. Many industries have aggressively pursued cloud strategies and some of them are yielding phenomenal results. Most research firms say that Cloud is something that will shape the future of technology in days to come. In current IT circles, the Internet is often referred to as The Cloud. Think of multiple computers in a giant mesh all interworking together. Although you may not physically see it, The Cloud is there for all sorts of signals: data, telephony, digital, etc. The term “Cloud Computing” denotes the use of cloud- or Internet-based computers for a variety of services. In its historically sholife span, its usage is still evolving as we speak. webcam, you are using services in The Cloud, i.e., not installed or contained within your local device. What Is Cloud Computing As It Applies to Healthcare? Traditional healthcare IT departments are set up with an IT director and staff, a network infrastructure, and local data centers. For many years, the healthcare industry has been exchanging information, such as medical images and more recently electronic medical records, through a local network. It used to take weeks, months, or even years to plan, procure, and deploy IT infrastructure to connect embedded medical devices to the network and capture valuable data. Healthcare organizations use ventilators, heart monitors, ultrasound wands, and countless other portable medical devices. Traditionally, these devices are plugged into a hard-wired Internet connection, and the data is downloaded onto a local PC connected to a network. The data are downloaded at specified intervals, such as each night, or once per week. Many times the data are never used, or perhaps a physician will refer to the data after a problem has occurred. As cloud computing becomes more mainstream, healthcare institutions are evaluating whether a cloud solution can be an efficient alternative to traditional computing networks. 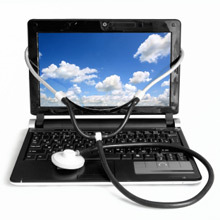 What are the benefits of Cloud Computing in Healthcare? Storing healthcare data in one central location—an online location—can be more efficient for healthcare providers. When patient data are stored in the cloud, healthcare providers can access that data anytime and anywhere through a secure online portal. In the future, cloud technology could allow patients to see a new doctor who could access all of their data and patient history immediately. Technology infrastructure and medical devices are expensive to deploy in the healthcare industry. Increased regulations and life-saving outcomes make the cloud a bit more complicated to embrace than it is in other industries. However, outsourcing bits and pieces of healthcare data services can still be cost-effective while improving patient care.